I made a 31 part video tutorial series that teaches how to make video games by actually making real games. On this one page I have both the videos along with links to all the code. On top of that you can download the full projects for every game here Pong, Space Invaders, Tetris, Mario, Ms. Pac-Man and Zelda. I’m confident that anyone that works through these tutorials will be able to make any game they can dream of. If you like tutorials like this consider donating $1, or simply turn off Ad Blocker while watching my tutorials. Either helps me to continue making free tutorials. How to Make Pong : In this video I finally start my How to Make Video Games tutorial series. I’m going to start off with Pong so that we can completely understand the Unity 5.6 interface, Sprites, Scenes, Physics, Keyboard Input, Collision Detection, Sound Effects, User Interfaces, Splash Screens, and so much more. How to Make Pong 2 : In this part we will create a Sound Manager which will hold and play our sound effects. We will also write the C# code required to make our ball ricochet off of paddles, walls and goals. How to Make Pong 3 : This time I’ll finish up the Pong game. If you’ve watched the previous parts you’ve learned all about : Collision Detection, Animation, AI Controlled Competitors, Physics, Keyboard Input, Unity User Interfaces, Splash Screens, Sound Effects, Background Music, Build Settings and more. How to Make Space Invaders : This time we’ll make Space Invaders and learn a ton about making complex games. I’ll cover How to Draw Pixel Art with Gimp, Sprite Sheets, SoundManager, Camera, Animating Bullets, User Interfaces, Prfabs, Collisions, Ignoring Collisions, Sound Effects, Making Objects Appear, OnTriggerEnter, SpriteRenderer, Changing Sprites, Destroying Objects, AI Players, Randomizing AI Actions, StartCoroutine, Yield, Animated Explosions and numerous tips that will help you avoid mistakes. How to Make Space Invaders 3 : In this part I’ll cover Sound Effects, Bullets, Making Objects Appear, OnTriggerEnter, SoundManager, Changing Scores, SpriteRenderer, Changing Sprites, Destroying Objects, and a bunch of tips on how to avoid mistakes. How to Make Space Invaders 4 : In this part of my Video Game Tutorial we completely finish Space Invaders! Well create the Alien AI, Think About when it Makes Sense to Ignore Collisions, Randomize AI Firing, Change Images, Hone AI Movement, Make Objects Appear, Randomize Actions, Animate Explosions, Utilize Sound Effects and use StartCoroutine, SpriteRenderer, Yield and more. How to Make Tetris : In this video I start making one of the greatest games ever being Tetris! I’m trying something new this time. In previous videos I tested ideas before videoing them. This time I will create Tetris with no previous preparation. I’ll test my way through creating the whole game. How to Make Tetris 2 : This time I cover how to Move and Rotate Shapes, Except Keyboard Input, Spawn Shapes, Handle Custom Collisions, Debug, Make Shapes Fall, and Move Objects at Different Time Frames. How to Make Tetris 3 : Our goal this time is to get those Tetris shapes to stack on each other. A lot more goes into that then we may have thought. I’ll be covering Simulating Game boards in Arrays, Printing Arrays, Removing Event Handling from Objects, Instantiating Objects, Debugging, Moving All Shapes in a Scene and a whole lot more. How to Make Tetris 4 : In this video we will focus on deleting full rows. We will search each column in each row to find those full of cubes. Then we’ll delete them in the array as well as in the scene. Then we have to bring all blocks above down and then increase the score on the screen. How to Make Tetris 5 : In this part of my How to Make Video Games Tutorial series we finish Tetris!!! We add sounds, increase game difficulty, create a game over scene, display the next Tetris shape before it is displayed and much much more. How to Make Mario : In this video tutorial we start making a Super Mario Clone!!! I’ll cover Pixel Art with Gimp, Sprites, Setting up a New Game, Cleaning up Images, Slicing Sprite Sheets, Designing Scenes, Tracking Chracters with a Camera, and Much More. How to Make Mario 2 : We cover Sorting Layers, Animations, Collisions, Controlling Characters, Awake(), Changing Characters Facing Direction, Jumping, Raycasting and Much More. How to Make Mario 3 : In this part of my tutorial on how to make a Super Mario Clone we cover a ton of topics! We cover how to Fix Collision Errors, Fix Scene Errors, AnimationCurve, Moving the UI with the Camera, Block Collisions, Reacting to Collisions from 1 Direction, Exploding Brick Blocks, Coins, Sounds and More. How to Make Mario 4 : In this video tutorial we completely finish our Mario Clone!!! It has been a ton of fun for me. I hope you have liked it as well? In this video we will Learn how to Program Wall Jumping, Use Raycasts, Animate Enemies, Create Enemies that Attack, Use Gizmos, Draw a Sprite Sheet, Slice Sprite Sheets and a whole bunch more. How to Make Pac-Man : You asked for it, and now here it is a Ms. Pac-man Clone! In this specific video I’ll cover how to draw all the sprite assets in Gimp including the Ghosts, Ms. Pac-Man, GameBoard, Dots, etc. Then we’ll cover how to create a pixel precise grid layout, setup our project, create sprite sheets, create animations, sorting layers, and so much more! Understanding how grid based games work will dramatically increase the number of games you can make. How to Make Pac-Man 2 : In the next 2 videos I’ll cover how to lock Ms. Pac-Man perfectly inside of the maze as she moves around. We will do this not through colliders, but instead by using pivot points, which will make the movement very clean and also resource light. We’ll cover how to Setup Pivot Points, Putting GameObjects in an Array, Selecting GameObjects in Code, Cycling through GameObjects in Empties, Moving Ms. Pac-Man, Animating Ms. Pac-Man and much more. How to Make Pac-Man 3 : In this video I finish setting up the system that will allow Ms. Pac-Man to perfectly travel through the maze. We’ll cover how to calculate if Ms. Pac-Man can Move in Certain Dirctions, Working with GameObjects in an Array, Keeping Ms. Pac-Man from Getting Stuck, Simulating Hitting Walls, Animating, Changing Ms. Pac-Man’s Direction without Pivot Points and more. How to Make Pac-Man 4 : This time we will Find out How to use Multiple Audio Sources, Set up Sound Effects, Allow Ms. Pac-Man to Eat Dots, Set up the Interface, Update Scores when She Eats Dot and a whole lot more. How to Make Pac-Man 5 : In this part of my Video Games Tutorial I show how to make the hardest part in Pac-Man, which is the Ghost AI Algorithm. We’ll Create the Ghost AI so Ghosts Circle Around the Maze on their own, They’ll React to Collisions with Pivot Points and They’ll Always Remain Perfectly Centered. We’ll also have the Ghosts Move Erratically, Use an Array to Store Game Objects, Make Ms. Pac-Man use Portals and a whole bunch more. How to Make Pac-Man 6 : In this part of my tutorial on making Ms. Pac-Man we learn all sorts of useful techniques. We’ll learn how to use arrays to keep Ms. Pac-Man in the maze, modeling a game board in an array, turning ghosts blue, animating ghosts, accessing game object scripts in code, going through portals, more about StartCoroutine, sound effects and much more. 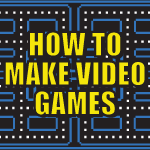 How to Make Pac-Man 7 : In this video we finish Ms. Pac-Man and learn how to do even more! We’ll create and set up all 4 Ghosts, position Ghosts in the center cell, return Ghosts after eaten, move Ghosts randomly, chase Ms. Pac-Man, have Ghosts eat Ms. Pac-Man, update scores and a whole lot more. How to Make Zelda : This is the first part of my video series in which I will make a Legend of Zelda clone. I get asked all the time to cover how to make pixel art, so I’ll cover that first. I’ll show exactly how I drew Link and then I’ll draw a ground sprite as well. We’ll also look at the finished sprite sheet I’ll use for the game. How to Make Zelda 2 : In this part of my Video Game Tutorial I’m going to setup all of my Zelda clones assets and create the entire board. These techniques can be utilized to make games in multiple frameworks. I a future video I’ll also show you how to do this in a Unity centric way using a program called the Tiled Map Editor. How to Make Zelda 3 : In this part of my How to Make Video Games Tutorial we’ll cover how to animated Link, moving Link, creating a game board array and numerous other things. How to Make Zelda 4 : In this part of my Video Games Tutorial we will continue to design our Zelda clone, but this video is also a stand alone tutorial. We’ll be taking a look at how the Tiled Map Editor can make it easy to design levels. We’ll then bring those levels into Unity with Tiled2Unity. As an added bonus I’ll show you a quick way to fix Sprite Tearing. How to Make Zelda 5 : As we continue making Zelda, I’ll show you how to make the camera follow Link. We’ll create a script that animates Link smoothly. I’ll show you how to handle collisions between game assets and I’ll demonstrate the usefulness of tags. We’ll also make a Sound Manager we’ll use the play all our sounds and much more. How to Make Zelda 6 : In this part of my How to Make Video Games series I will continue making a Zelda clone. I’ll create animations for the villains and animate them. I’ll also cover a new way to animate Link’s sword from inside of code. We’ll use coroutines to make items show and then disappear on the screen and a whole lot more. How to Make Zelda 7 : In this part of my video game tutorial I will continue making Zelda. I’ll focus this time on something I have not covered before which is how to create the AI for our villain so that he will travel on his own around the game board looking for Link. The villain will travel around using very few system resources. He will be able to locate Link any place on the map. We will use multidimensional arrays to store travel nodes. We will also learn how to find out which node game objects are closest to. How to Make Zelda 8 : In the final video of my How to Make Video Games series I’ll cover many things not covered before. We’ll mainly focus on how to animate throwing the boomerang. I’ll animate the path and rotation of the boomerang directly in Unity. I’ll then write the code for stunning the villains hit by the boomerang.